Combine the cream, mayonnaise, lime juice, sugar, salt and pepper in a large bowl and mix well. Add the green and red cabbage and toss with the dressing. Taste and adjust the salt to taste. Serve. Is it really only a 1/4 tspn sugar? Yep…you just need a little bit of sugar. But you can always adjust it to your own tastes, Lynne. Thank you for your time & energy in demonstrating such wonderful recipes! I just wanted to ask: How many days in advance can this slaw be made ? & if there is something I can make or prepare w/out affecting taste, texture etc. Thank YOU for trying the recipes, Jina! 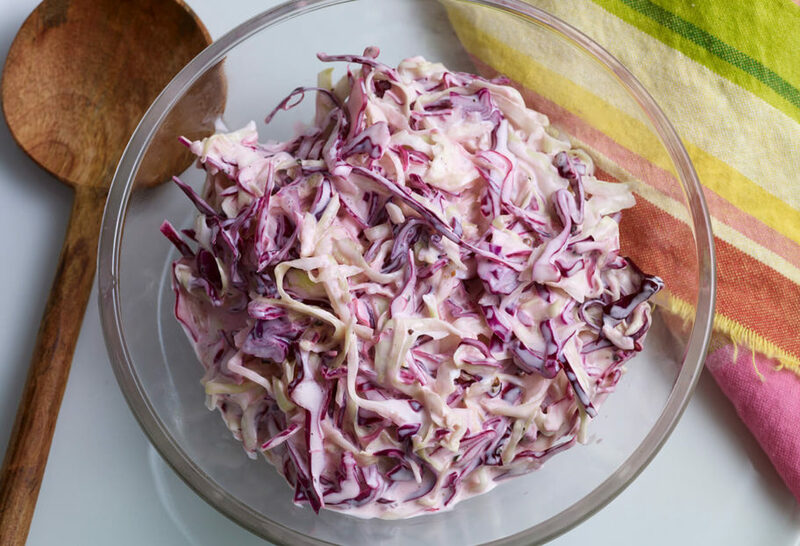 The slaw is good in the fridge for 48 hours.